Native to Australia, Marsilea hirsuta is a member of the water clover family. It’s also known as the dwarf four leaf clover because of its small size. In marshland conditions, this species develops small clover shaped leaflets when out of the water; under water ovate leaflets typically form, which are strongly reminiscent of the Glossostigma plant. Marsilea hirsuta, though, is far easier to grow and extremely low maintenance. It does take a certain length of time for a new plant to acclimatize to the tank, but it gradually forms an attractive carpet. Any emersed shoots should be completely cut off prior to planting; new submersed shoots will gradually develop. 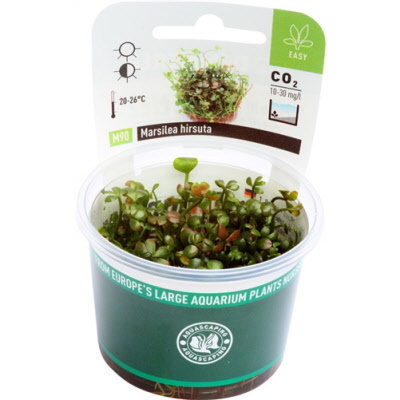 One benefit to the InVitro culture cups is that they have many little tiny plantlets that can be separated and spread throughout your tank, so you get great value for your money.